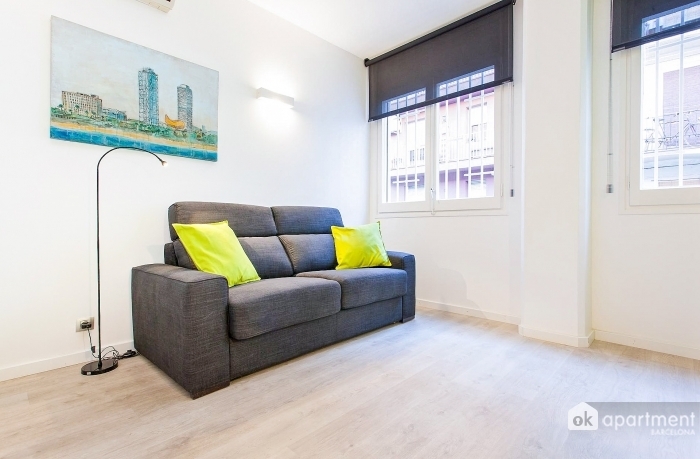 This apartment is recently renovated and is situated in the Eixample district of Barcelona. Just 5 minutes walk from the Plaza Universitat. The apartment is consists of a double bed, bright living room with dining area, bathroom with shower and fully equipped open plan kitchen. In the living room you will find TV and a table with 4 chairs. The flat has internet connection (included in the price) and Air conditioning. In the area you will find all amenities such as shops, supermarkets and pharmacies. You can also find restaurants as well as famous monuments of the city. The nearest metro stations are Universitat (L2) and Urgell (L1), as well as different bus lines which connect with the whole city.